This is Lady Gregory's collation of the Cuchulain cycle. 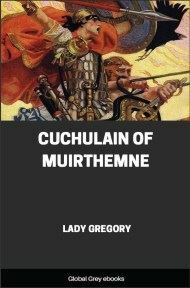 Cuchulain was a mighty warrior, 'the Hound of Ulster', the hero of 'the Red Branch', a band of elite fighters of ancient Ireland. 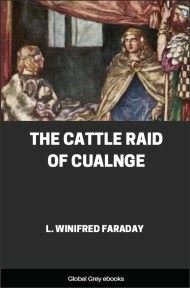 Cuchulain is the subject of numerous tales set in pre-Christian Ireland, including the pivotal 'War for the Bull of Cuailgne'. 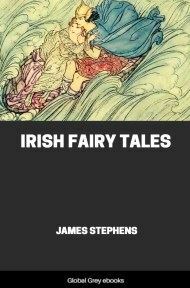 The mythological and supernatural elements are tightly interwoven in this saga, including the ever-present Sidhe (fairies); and Celtic gods and goddesses, particularly Morrigu, the goddess of war. 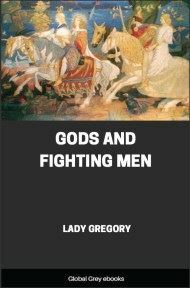 As for the battles, they are principally composed of single combats as hair-raising as any in the Iliad or the Mahabharata. The female characters are vivid and self-motivated. 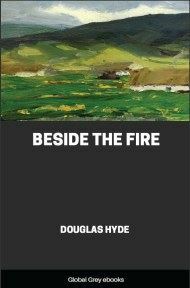 The saga is overlaid with episodes which could be echoes of ancient myths, for instance the story of the two shapeshifting swineherds. There are sections of great poetry embedded in the text, particularly the lament of Emer on Cuchulain's death. IN the time long ago, Conchubar, son of Ness, was King of Ulster, and he held his court in the palace of Emain Macha. And this is the way he came to be king. He was but a young lad, and his father was not living, and Fergus, son of Rogh, who was at that time King of Ulster, asked his mother Ness in marriage. 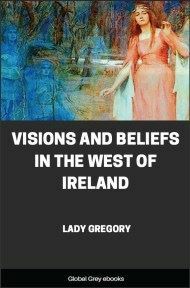 Now Ness, that was at one time the quietest and kindest of the women of Ireland, had got to be unkind and treacherous because of an unkindness that had been done to her, and she planned to get the kingdom away from Fergus for her own son. So she said to Fergus: "Let Conchubar hold the kingdom for a year, so that his children after him may be called the children of a king; and that is the marriage portion I will ask of you." "You may do that," the men of Ulster said to him; "for even though Conchubar gets the name of being king, it is yourself that will be our king all the time." So Fergus agreed to it, and he took Ness as his wife, and her son Conchubar was made king in his place. But all through the year, Ness was working to keep the kingdom for him, and she gave great presents to the chief men of Ulster to get them on her side. And though Conchubar was but a young lad at that time, he was wise in his judgments, and brave in battle, and good in shape and inform, and they liked him well. And at the end of the year, when Fergus asked to have the kingship back again, they consulted together; and it is what they agreed, that Conchubar was to keep it. And they said: "It is little Fergus thinks about us, when he was so ready to give up his rule over us for a year; and let Conchubar keep the kingship," they said, "and let Fergus keep the wife he has got." Now it happened one day that Conchubar was making a feast at Emain Macha for the marriage of his sister Dechtire with Sualtim son of Roig. And at the feast Dechtire was thirsty, and they gave her a cup of wine, and as she was drinking it, a mayfly flew into the cup, and she drank it down with the wine. And presently she went into her sunny parlour, and her fifty maidens along with her, and she fell into a deep sleep. And in her sleep, Lugh of the Long Hand appeared to her, and he said: "It is I myself was the mayfly that came to you in the cup, and it is with me you must come away now, and your fifty maidens along with you." And he put on them the appearance of a flock of birds, and they went with him southward till they came to Brugh na Boinne, the dwelling-place of the Sidhe. And no one at Emain Macha could get tale or tidings of them, or know where they had gone, or what had happened them. It was about a year after that time, there was another feast in Emain, and Conchubar and his chief men were sitting at the feast. And suddenly they saw from the window a great flock of birds, that lit on the ground and began to eat up everything before them, so that not so much as a blade of grass was left. The men of Ulster were vexed when they saw the birds destroying all before them, and they yoked nine of their chariots to follow after them. Conchubar was in his own chariot, and there were following with him Fergus son of Rogh, and Laegaire Buadach, the Battle-Winner, and Celthair son of Uithecar, and many others, and Bricriu of the bitter tongue was along with them. They followed after the birds across the whole country southward, across Slieve Fuad, by Ath Lethan, by Ath Garach and Magh Gossa, between Fir Rois and Fir Ardae; and the birds before them always. They were the most beautiful that had ever been seen; nine flocks of them there were, linked together two and two with a chain of silver, and at the head of every flock there were two birds of different colours, linked together with a chain of gold; and there were three birds that flew by themselves, and they all went before the chariots, to the far end of the country, until the fall of night, and then there was no more seen of them. And when the dark night was coming on, Conchubar said to his people: "It is best for us to unyoke the chariots now, and to look for some place where we can spend the night." Then Fergus went forward to look for some place, and what he came to was a very small poor-looking house. A man and a woman were in it, and when they saw him they said: "Bring your companions here along with you, and they will be welcome." Fergus went back to his companions and told them what be had seen. But Bricriu said: "Where is the use of going into a house like that, with neither room nor provisions nor coverings in it; it is not worth our while to be going there." Then Bricriu went on himself to the place where the house was. 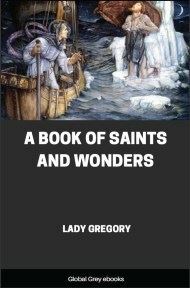 But when he came to it, what he saw was a grand, new, well-lighted house; and at the door there was a young man wearing armour, very tall and handsome and shining. And he said: "Come into the house, Bricriu; why are you looking about you?" And there was a young woman beside him, fine and noble, and with curled hair, and she said: "Surely there is a welcome before you from me." "Why does she welcome me?" said Bricriu. "It is on account of her that I myself welcome you," said the young man. "And is there no one missing from you at Emain?" he said. "There is surely," said Bricriu. "We are missing fifty young girls for the length of a year." "Would you know them again if you saw them?" said the young man. "If I would not know them," said Bricriu, "it is because a year might make a change in them, so that I would not be sure."